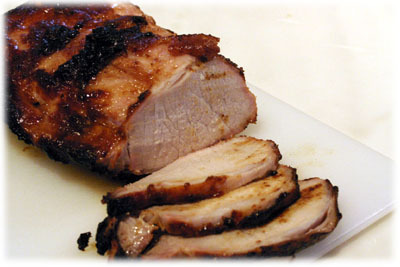 Even if you don't have a bbq rotisserie you can still enjoy this boneless pork loin roast recipe on your grill. It's pretty easy to prepare, you just insert slivers of garlic deep into the pork loin and then let it marinate in a sweet & sticky honey garlic sauce. 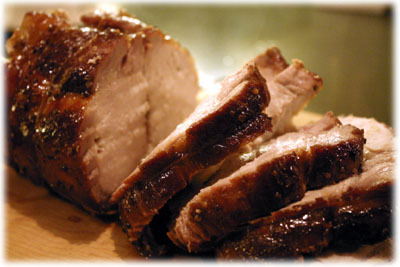 Many boneless pork recipes run the risk of being too dry, something this recipe avoids by wrapping the roast in foil during most of it's cooking time on the grill. 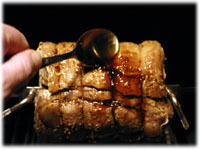 The foil keeps most of the juices and honey garlic flavors within the pork loin and is only removed near the end of cooking to brown up the meat and give it a nice sweet crispy coating. 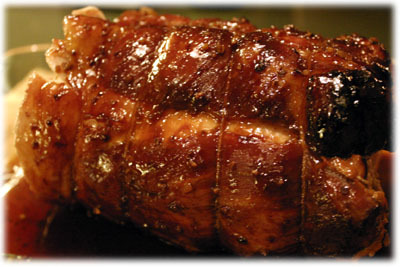 It's no secret I love honey garlic on chicken and ribs so it was a natural choice when it came time to cook this pork roast. The other trick to this recipe are the slivers of garlic you shove deep into the roast. The garlic flavors are infused from the inside out as it cooks. This is a pretty impressive dish to serve guests, the honey garlic coating is nice and shiny and sticky and flavors are really amazing. 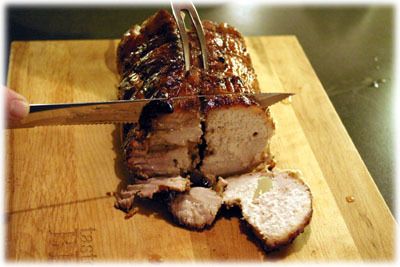 Place your 4 - 5 lb boneless pork loin on your working surface and carefully insert a sharp knife in 12 places. Insert the knife mid-way into the roast, these will be where you insert the slivers of garlic. Peel the 6 cloves of garlic and slice them in half to make 12 slivers. 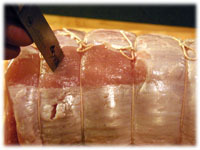 Insert 1 sliver into each slit you've made in the pork loin. 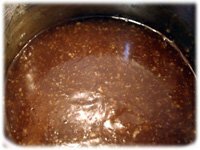 In a medium sauce pan combine the honey garlic marinating and basting sauce ingredients. Bring to a gentle boil and let simmer for 5 minutes. Remove from heat, cover and set aside to cool. 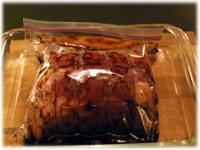 Place the pork roast in a resealable plastic bag and pour 1/2 the honey garlic marinade into the bag. Seal the bag and work the roast around well to completely cover with the sauce. Place the sealed bag in a shallow dish in case the bag leaks and place in the refrigerator for at least 2 hours but best if left overnight. Cover the reserved honey garlic sauce and refrigerate until needed. Insert the rotisserie spit (or skewer) through the center of the roast lengthwise. Install the prongs on the spit and insert them into the meat. Center the roast on the spit and tighten the prongs onto the spit so the loin is firmly secured. 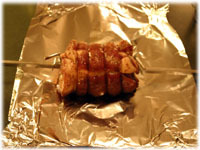 Place a fairly large sheet of aluminum foil on your working surface and place the rotisserie skewered pork roast on the foil towards 1 end. Carefully roll up the rotisserie pork in the foil so it's sealed. 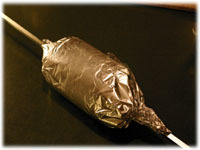 Squeeze the foil closed around the rotisserie spit at each end. Wrapping in foil seals in the juices while cooking and is what makes this recipe so tender and juicy when served. Set up your barbecue or grill for indirect cooking. 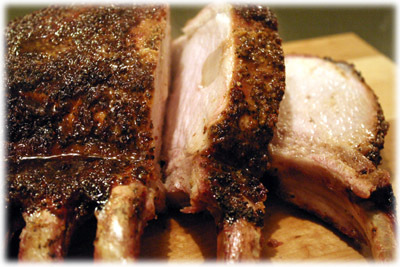 Place a disposable aluminum pan at least the size of the rotisserie pork bundle on the grates. Fill the pan 3/4 full with water. Install the spit into the rotisserie motor and ensure the roast spins freely over the pan. If you find the roast is not spinning freely and the pan interferes with it then remove the center grate from the grill and place a disposable aluminum pan over the unlit burners. 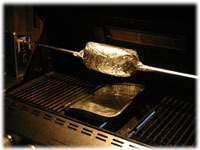 Heat the grill to 350F - 375F, turn on the rotisserie motor and close the lid. 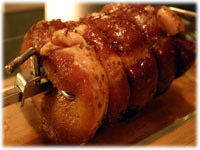 After 45 minutes or so stop the rotisserie motor and remove the aluminum foil from the pork roast and discard the foil. Restart the rotisserie spinning and slowly baste the roast with some of the reserved honey and garlic sauce. Baste the roast every 5 minutes for 15 minutes until the meat reaches an internal temperature of 150F and the exterior of the roast is nicely browned and sticky. It's important to cook this roast by temperature instead of relying on a specific cooking time. Larger roasts will take longer to cook so remove at 150F internal temperature. 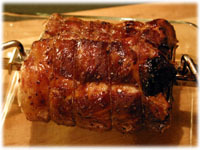 Remove the cooked pork and rotisserie from the grill and place in a shallow dish large enough to hold the roast. This catches any drippings. 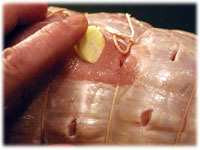 Cover with aluminum foil and let rest 5 minutes or so to allow the juices to re-integrate within the meat. After the meat has rested remove the foil and transfer the roast to a cutting board. Begin slicing the roast, 3/8" to 1/2" thick slices is nice. In the picture below you can even see some of the garlic slivers that were inserted into the roast. This one did it's job nicely, the pork loin had a fantastic garlic flavor infused throughout the meat and it was very juicy.